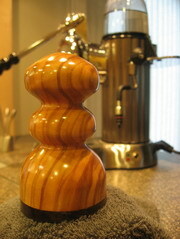 Pretty Tamper Arrives in Parker! I’ve been looking forward for some time to receiving a very special piece of coffee-making equipment — my new olivewood Thor Tamper. 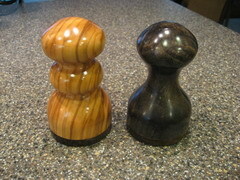 These tampers are custom made by Les Albjerg, and can be found at http://www.thortamper.com/. Well, it arrived yesterday, and I’ve been really enjoying it. 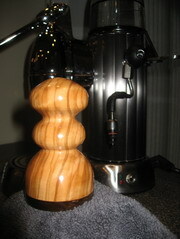 I like its look, its feel, and the tamp it produces. Can’t do much better than that. 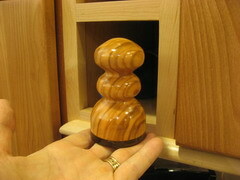 My olivewood Thor Tamper in its new home. Part of the beauty of Thor Tampers is that they’re made to order, with a wide choice of woods. Les and I both felt that his olivewood would look especially good with the two woods (red cedar, birch) in our new kitchen. I picked the style on the left because I found the shape visually appealing. To my surprise, I also really prefer the feel of this tamper to the more popular shape on the right. My new toy, feeling right at home in the spotlight. Posted 11 years, 8 months ago at 10:31 pm.